One of the beautiful things about Oriental rugs, apart from the intricacy of their artisanship and design, is their ability to heighten any décor, whether they are serving as a centerpiece or simply as accent. This month, with the holidays only a couple of weeks away, we at Ahdoot wanted to offer some tips on beautifying your living space using one of the season’s most defining and notable color choices: the passionate shade of red. Red has gained a lot of popularity in the past decade, being described as one of the more contemporary colors an individual can add to their home, yet it has also played a tremendous role throughout history, with even the White House dedicating a single room to the fiery tint. Nevertheless, red is a color best utilized in an understated way, according to most decorating experts, as it can sometimes overpower a room with an aggressive style, or even seem too cheerful in its execution. Remember, even red neckties have been called “power ties”, so it’s important to recognize the command this color demonstrates. If you’ve already decided to go all-in with this lively color, it’s important it be done tastefully, so as to not overstimulate yourself or your guests. However, even if you plan on using variations of red extensively throughout your home, or just a single room, it can be done without appearing too bold. Focusing on the color itself, with a balanced and elegant set of accent pieces, can really exhibit your technique as a decorator. This rug in particular, a sophisticated and elegant Anatolia rug from the late 15th or 16th century, is filled with the energy of red, and would make a great addition to a living room or study. And while it may be saturated with the color, it still presents other hues which are not only complementary to the rug itself, but can be drawn out of the piece by the addition of indigo lamps, fawn end tables, or other paired décor. If being bold with your color scheme doesn’t suit your personal tastes, adding a splash of red throughout a room is the next best thing, and it can definitely underscore a deep sense of decorating expertise without being overly grandiose. As already stated, if an Oriental rug is going to serve as a room’s centerpiece, and it often does without even trying, it’s important to dress its exterior with the appropriate amount of corresponding pieces, using the rug itself as a guide. This Bukhara Suzani carpet could be considered robust in the red department, however, its brilliant usage of deep sky and navy blues throughout the article leave a homeowner or designer plenty to work with in terms of creating a balanced aesthetic. In fact, a room containing an accent wall matching either the darker or lighter blues in the rug, as well as a few similar accent pieces (which might also include some modest reds), could really make a room appear both stylish and refined. 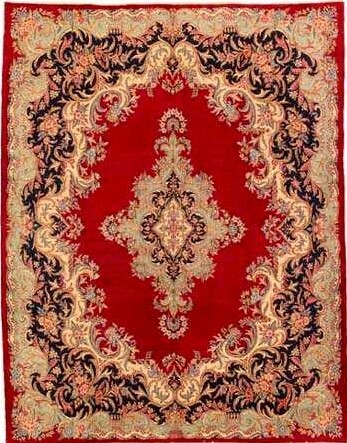 Whether you are redecorating or searching for the right Oriental rug for your home or office, be sure to browse our inventory for a large selection of antique and modern carpets guaranteed to redefine your living or work space. Also, if you already own a rug which has seen better days, allow us to reinvigorate your piece through our comprehensive cleaning services or by having one of our Oriental rug specialists make any necessary repairs. Happy decorating!